Not as popular as the apple, but a delightful fruit in its own right, the pear has ardent supporters. Hank Markgraf, Grower Services Manager with BC Tree Fruits will tell you there’s no fast ride to getting new pears into grower fields. Pears aren’t nearly as precocious as apples but those who love the fruit aren’t concerned. There are new varieties on the horizon, even if they may take a while. 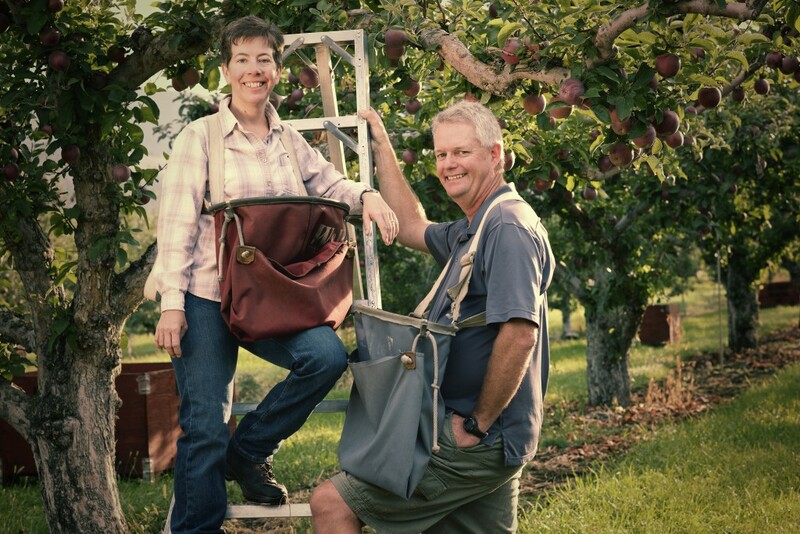 Kevin Day of Byrnes Farms, packed under Day’s Century Growers, has been growing pears for decades. While there are new options he’s interested in, he says he wouldn’t change how he’s structured his orchard over the years. That’s the point with pears, really. One has to be content with choices for the long haul. Day would know, his family has been on the same plot of land since pre-1900. Pears have been part of his landscape since at least the 1920s. Perhaps it isn’t interest but awareness that keeps pear aficionados relaxed. 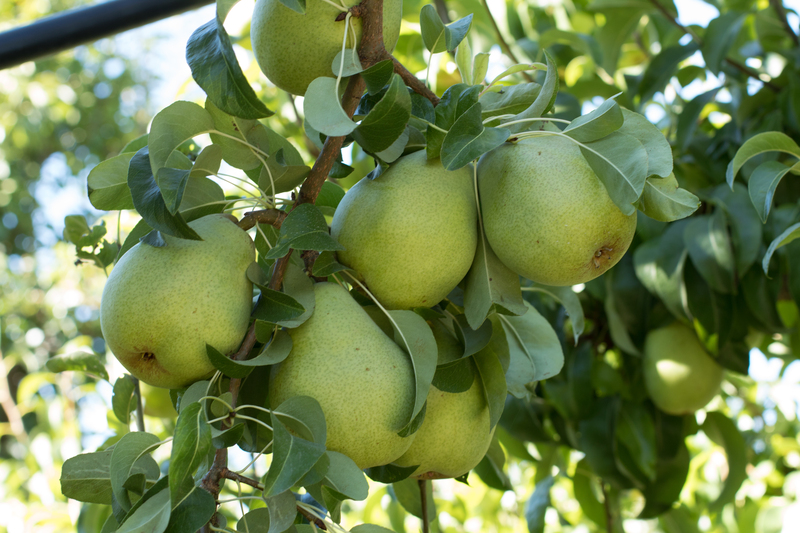 Growers know it takes three to five years for a pear tree to bear fruit, while the apple takes one to three years—all depending upon varieties and graft stock of course. Markgraf notes when apples are compared to pears over a 300-year time span, it’s no wonder apples win the variety race. 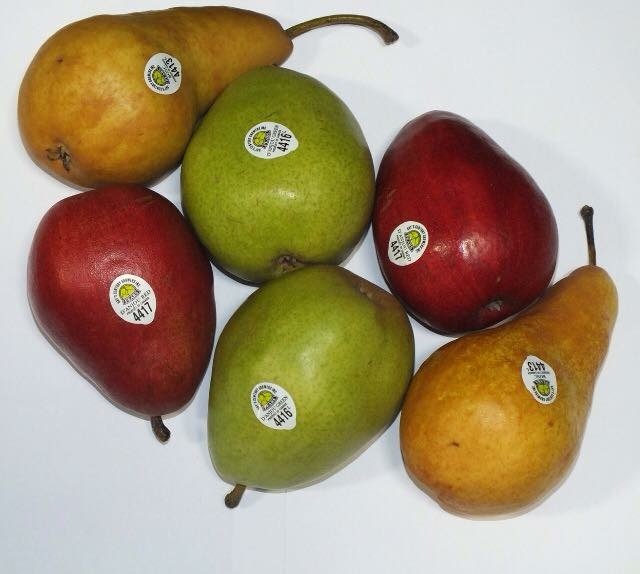 In B.C., Markgraf estimates 95% of pear growers are concentrated in the Interior region with others in the Lower Mainland or on Vancouver Island. He and his team of horticultural advisors help B.C. growers with everything from pruning to irrigation, but Markgraf also looks at new varieties. He adds that there are varieties of interest that may be even better than Harrow Crisp from the Harrow Research program but it will be five to 10 years before they become common knowledge. It generally takes about 10 years or more from interest in a variety to commercial availability. He adds that there are always varieties coming out of Belgium, Holland and France, but despite that interest, these haven’t gone very far yet. Day has some Harrow Crisp stock in his nursery now, though Markgraf notes it isn’t taking off widely yet. Currently, Day has 40 acres in Kelowna planted primarily with the three varieties Markgraf notes have served growers well: Bartlett, Bosc and both red and green d’Anjou. Day describes his orchard as being dominantly “pears that I grew up with—d’Anjou, Bartlett, and Bosc.” But he continues to stay in touch with the pear community for options. Both Harrow Crisp and Harovin Sundown have been bred for fireblight resistance— a significant issue among pear trees. The fireblight bacteria can impact all pome species trees. Pear and quince are most susceptible and apple and crab-apple are also at risk. Markgraf notes this is where Lower Mainland and Vancouver Island growers have an advantage over their Interior counterparts. Control for fireblight is limited and, as Markgraf explains, planting a variety that is a significant risk isn’t the right option. While Lower Mainland growers also experience fireblight, they may be more successful with Conference and Comice which Markgraf sees as giving them an advantage. The bright red Piqa Boo out of New Zealand has captured Day’s interest as of late. He’s hoping to bring this variety into the fold in the future. Day’s Byrnes Farms grows more than pears, (though that may be Day’s primary passion) with vegetables and cattle sharing the 136 acre site. A few years ago, recognizing the need to advance the farm further, Day added the pear storage and packing house on the site. He had to take out some old pear trees to do so. Those old trees still produce and the younger ones offer great yields as well. In fact Day has heard he has among the highest levels of production when compared with his peers. He believes it’s about the overall care and respect of the crops, the soil and the land, along with the region’s micro climate. His farm, being of mixed use and having available habitat, allows for a good mix of beneficial predators to create a natural IPM program. Day sees a huge benefit in the mixed-use nature of his farm. He is able to use manure to cover a third of the pear orchard each year; so, within three years, the entire 40 acres is re-manured. 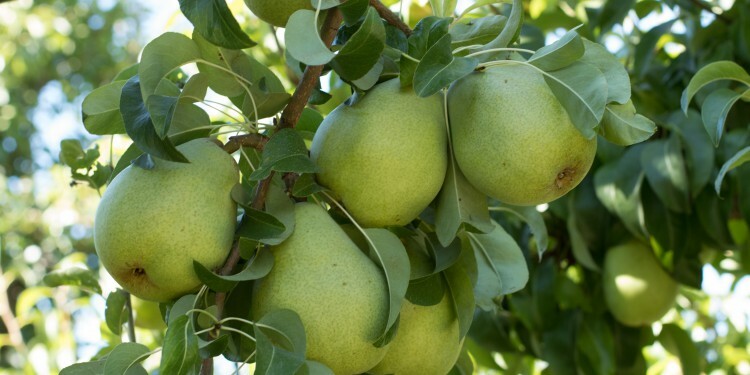 Pears may not be the fastest return on investment after planting, but they are worth the wait and new varieties may be what creates a wild and crazy love affair for the pear. 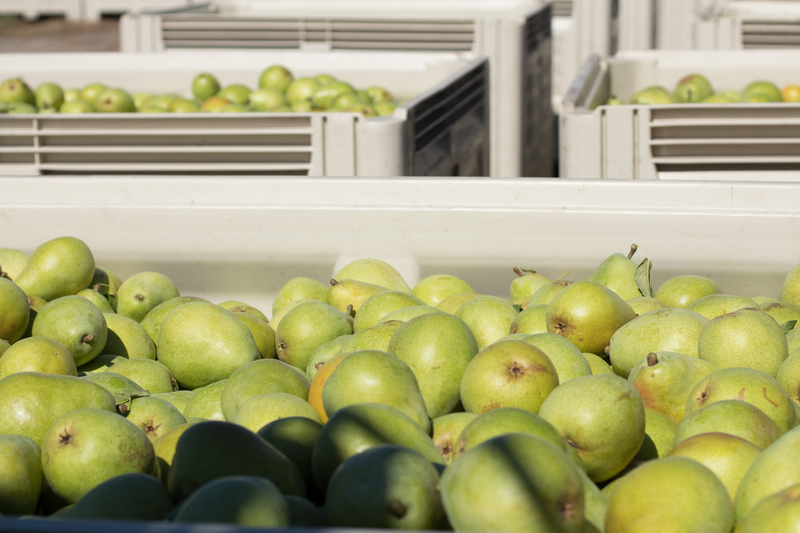 Markgraf and Day provide their take on classic and up-and-coming pear varieties. (Markgraf notes it also sometimes referred to as Williams) Easy to sell, consumers familiar with and understand to ripen them. Always a safe bet according to Day. Largest of the three main pears and needs to be ripened before eating. They will turn yellow and become buttery and creamy like Bartletts. Day notes it’s a wonderful pear when ripened properly but consumers often don’t understand how to manage it. “When people try a d’Anjou properly ripened, they love it,” Day notes. Shaped more like a d’Anjou (less pear shaped). Sweet, juicy, yellow-green with spots of red blushing. Bosc shaped with a long neck, smooth texture, not gritty or mealy. Sweet. Good for cooking. A sweet, crisp, yellow pear with a tree similar to Bartlett but maturing after Bartlett, notes Markgraf. No longer packed or produced for commercial sales.